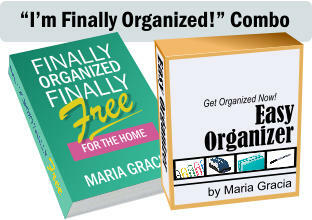 Affiliate Sales Tools to help you promote “I’m Finally Organized!” Combo Toolkit by Maria Gracia Promoting “Im Finally Organized!” Combo Toolkit is easy. You can use the product graphic of our product and the ads provided in your ezine. Text Ad Resources Below are our “highest” converting text ads for our ”I’m Finally Organized!” Combo Toolkit product. Please use them as presented here to maximize your conversions. Thanks! IMPORTANT…where it says XXXXXXXX in the LINK is where you put your Clickbank ID so you get proper credit for your sales. (Note: If you prefer to search for the product in the Clickbank Marketplace to get the “long code”, the product code you can search for is GONIFO) Please test your link to be sure it’s reaching my “I’m Finally Organized!” Combo Toolkit landing page before you promote. This link is included in TWO PLACES in each email. Ad 1 below, is the ad that should be run first. That one says that the promotion ends in 7 days. There is no exact date in there. Ad 2 below, is set up to be sent 3 days before the promotion ends. Ad 3 below, is set up to be sent 24 HOURS before the promotion ends. If you can run all 3, fantastic. I know you’ll get the highest conversions by doing so. If you can only run two, I ask that you run Ad 1 and Ad 3. The last one giving folks 24 hours left is the most vital. In our experience, it’s the one that will generate the most sales. Please let me know if you have any questions, and thank you again! Maria Gracia P.S. If you can let me know the dates you’ll be running “I’m Finally Organized!” Combo Toolkit, I would greatly appreciate it. Thank you! (Contact Link at the top of the column to the right) http://XXXXXXXX.gonifo.hop.clickbank.net --------------------------------------------------------------------------------------------------------------- Ad 1: 7 Day Promotion How to Quickly Organize Your Home, Your Time, and Your Life Even if You Don't Have One Ounce of Organizing Sense Announcing . . . The “I’m Finally Organized” Combo Toolkit! Get the quick details here: http://XXXXXXXX.gonifo.hop.clickbank.net Do you feel like, no matter what you do, you can't seem to get organized? Perhaps your clutter is always getting ahead of you, or your TO DO list is a mile long. Maybe you can't keep up with your tasks, or your paperwork is out of control, or your email has become overwhelming. Perhaps you just can't figure out where to store things? Maybe you find yourself procrastinating, or having trouble prioritizing. No matter what your organizing challenges are, they are all causing UNHAPPINESS, STRESS, EXHAUSTION, OVERWHELM, and FRUSTRATION...and those are five things you definitely don't need in your life. If you've been struggling to get yourself and your home organized, It's NOT YOUR fault. There are huge, little-known, obstacles that are preventing millions of people, like you, from getting quickly and permanently organized. The nice thing is, I have the perfect solution for any organizing challenge you're dealing with, and it will help you get permanently and automatically organized. My friend, Maria Gracia, is one of the best organizing specialists around and she created a powerful resource for getting organized quickly and easily. It's called 'I'm Finally Organized Toolkit' and it includes literally EVERYTHING you need to get organized now! You'll discover... * Dozens of secrets for clearing the clutter and the chaos, without having to toss everything * How to avoid getting overwhelmed with your TO DOs, and how to get more done in less time * Yes, you can be organized, even if you're a Pack Rat! * How to find hidden energy and motivation to not only start...but complete...any project * Creative and inventive storage ideas * Clean your house in half the time * Conquer your laundry mountain * Slay the raging, paper beast * Clear your email inbox easily...without missing anything important * Increase your productivity by leaps and bounds * How to ensure you never forget anything again...ever! * and so much more! You’ve got just 7 days to get all the bonuses I know you want to get started on your organizing journey now, and I'm excited to help you begin as quickly as possible. In light of this, when you get your hands on her ‘I'm Finally Organized!’ Combo Toolkit within 7 days, you'll get a whole bunch of amazing BONUSES... * What You Need to Know to Become Super Organized * Hilarious Versus Smart Clutter Tips * Get Organized Now! Favorite Reader Tips * 365 Words of Wisdom to Motivate and Inspire You * 50 Super Cool Ways to Organize Your Home and Your Life Begin getting organized. It's one of the most wonderful things you can do for yourself...it guarantees an easier, happier, more joyful life! Visit: http://XXXXXXXX.gonifo.hop.clickbank.net --------------------------------------------------------------------------------------------------------------- Ad 2: 3 Days Left 3 DAYS LEFT... “I’m Finally Organized!” Combo Toolkit... Quickly Organize Your Home, Your Time, and Your Life Even if You Don't Have One Ounce of Organizing Sense The other day, I mentioned a new resource being offered by my friend, and organizing expert, Maria Gracia. It's called “I’m Finally Organized!” Combo Toolkit...and it will help you get rid of all the clutter in your life, once and for all. Plus, she's giving away all sorts of goodies to my readers, but ONLY FOR THE NEXT 3 DAYS. So don't procrastinate! http://XXXXXXXX.gonifo.hop.clickbank.net Here’s what others are saying. . . “Hands down - - - the BEST! Your organizing toolkit provides so many practical organizing solutions and so much more, that I feel it’s hands down -- the BEST! Thank you for packing in so much great information at such a low price. I LOVE it!” -- Judith N.San Diego, CA “FINALLY - I am getting organized! I’ve tried so many times in the past and failed. But this time, I’m really getting organized. And it’a all because of your Finally Organized Toolkit! I can’t thank you enough.” -- Barbara W.Trenton, NJ No matter what your organizing challenges are, they are all causing UNHAPPINESS, STRESS, EXHAUSTION, OVERWHELM, and FRUSTRATION...and those are five things you definitely don't need in your life. If you've been struggling to get yourself and your home organized, It's NOT YOUR fault. There are huge, little-known, obstacles that are preventing millions of people, like you, from getting quickly and permanently organized. The nice thing is, the “I’m Finally Organized!” Combo Toolkit is the perfect solution for any organizing challenge you're dealing with, and it will help you get permanently and automatically organized. But, you have only 3 DAYS left . . . This is a huge resource that also comes with a boatload of free bonuses. But only for 3 days more! You can get all the details at the following page. It’s a quick read and it’s filled with fun, descriptive pictures and graphics so you can see at a glance all the wonderful resources you will receive. Begin getting organized today. It's one of the most wonderful things you can do for yourself...it guarantees an easier, happier, more joyful life! Visit: http://XXXXXXXX.gonifo.hop.clickbank.net Do it now -- time is running out. --------------------------------------------------------------------------------------------------------------- Ad 3: Last Chance - 24 Hours Left LAST CHANCE... ONLY 24 HOURS LEFT... “I’m Finally Organized!” Combo Toolkit... Quickly Organize Your Home, Your Time, and Your Life Even if You Don't Have One Ounce of Organizing Sense Plus, you’ll get our package of bonuses and complimentary Lifetime Updates on the core components of this Combo Toolkit -- but time is running out! The other day, I mentioned a new resource being offered by my friend, and organizing expert, Maria Gracia. It's called the “I’m Finally Organized!” Combo Toolkit...and it will help you get rid of all the clutter in your life, once and for all. Plus, she's giving away all sorts of goodies to my readers, but ONLY FOR THE NEXT 24 HOURS. So don't procrastinate! http://XXXXXXXX.gonifo.hop.clickbank.net Here’s what others are saying. . . “Thank You, Maria. I’m loving it! I’ve been searching for an organizing resource that provides more than just tips. Your toolkit gives me so much more. You’ve given me unlimited ideas for organizing everything. Thank you, Maria. I’m loving it!” -- Maryann G.Alisson, KS “I cant believe how much I received! I’ve been on your newsletter for many years and so I know how much information you give away for free. But, I still can’t believe how much I received in this package for such a low price. Bless you.” -- Susan T.Orlando, FL No matter what your organizing challenges are, they are all causing UNHAPPINESS, STRESS, EXHAUSTION, OVERWHELM, and FRUSTRATION...and those are five things you definitely don't need in your life. If you've been struggling to get yourself and your home organized, It's NOT YOUR fault. There are huge, little-known, obstacles that are preventing millions of people, like you, from getting quickly and permanently organized. The nice thing is, the “I’m Finally Organized!” Combo Toolkit is the perfect solution for any organizing challenge you're dealing with, and it will help you get permanently and automatically organized. But, you have only 24 HOURS left . . . This is a huge resource that also comes with a boatload of free bonuses. But only for 24 hours more! You can get all the details at the following page. It’s a quick read and it’s filled with fun, descriptive pictures and graphics so you can see at a glance all the wonderful resources you will receive. Begin getting organized today. It's one of the most wonderful things you can do for yourself...it guarantees an easier, happier, more joyful life! Visit: http://XXXXXXXX.gonifo.hop.clickbank.net Do it now -- time is running out.